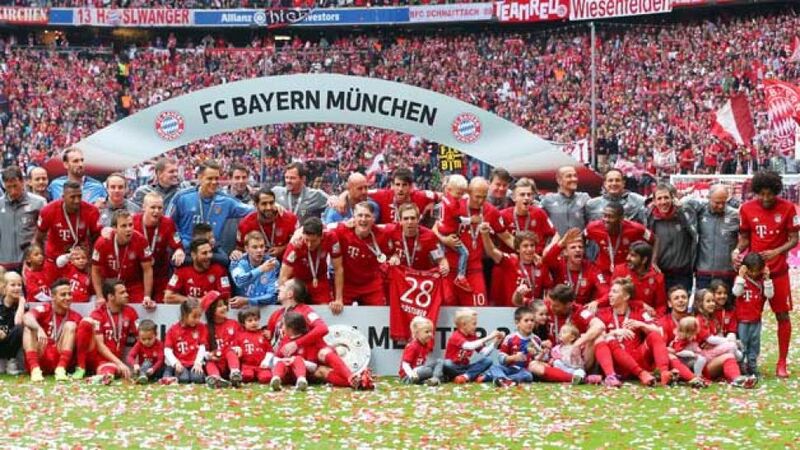 Munich – FC Bayern München eased into their weekend of Bundesliga title revelry with a comfortable 2-0 victory over 1. FSV Mainz 05 at the Allianz Arena on Saturday afternoon, preceding wild celebrations after being presented with the Meisterschale by DFL CEO Christian Seifert. Robert Lewandowski netted his first-ever spot-kick for Bayern to put the Bavarians in front, before Bastian Schweinsteiger crowned his 500th competitive outing for the club with a well-taken finish after the break. The festivities began even before kick-off at the Allianz Arena, with a parade of the club’s former stars forming a guard of honour for the current championship winning side as they entered the pitch, while the stadium sang out a rendition of the club’s anthem ‘Forever Number One’. As such the match was delayed by a few minutes, with four goals scored in other fixtures elsewhere before the action here had even commenced. Once the ball was rolling, however, Bayern assumed control of proceedings and looked for an early goal to get into the party spirit. Philipp Lahm went closest, but his well-timed header from Thomas Müller’s cross went straight at Mainz keeper Loris Karius. Moments later Schweinsteiger surged forward and dinked a pass over the visiting defence to Müller, who was unable to control it at a stretch. Mainz sporadically threatened to exploit the spaces in Bayern’s backline on the break with long balls forward, but their passing was too inaccurate to cause the hosts any problems. Midway through the first half the Bundesliga champions’ pressure took its toll, with Lewandowski converting from the penalty spot after Niko Bungert had handled inside the box. After the break Bayern quickly earned some breathing room, as Lewandowski expertly brought down a long ball in the area before turning and laying off for Schweinsteiger, who curled a side-footed effort into the net. The guests almost hit back straight away, but Julian Baumgartlinger shot straight at Manuel Neuer when unmarked ten yards out. Mainz had another golden opportunity shortly afterwards when Yunus Malli was played through one-on-one with Neuer, but the forward was too indecisive, allowing Dante to get back and nudge him off the ball. Substitute Claudio Pizarro had a wonderful chance to add to the scoreline seconds after coming on for Lewandowski, but the Peruvian scuffed his shot straight at Karius. To their credit, Mainz never stopped looking for a goal despite having little to play for, with European qualification out of reach and relegation mathematically impossible as of last week. They frequently looked dangerous at set-pieces, but Neuer was always on hand to keep them at bay. At the other end Bayern had a couple more half-chances but no longer had the same sense of purpose in attack, meaning the match finished 2-0, but the celebrations continued for a long time afterwards. See the post-match celebrations at the Allianz Arena in this video, courtesy of the Bundesliga's official YouTube channel.